Owners in the three-county Johnson City Metropolitan Statistical Area (MSA) who sold during Q3 got an average of $8,000 less than those who sold during the same quarter last year while sellers in the Kingsport-Bristol MSA got an average of $850 more. The percentage of Johnson City metro area distressed sales was up 31% compared to last year, but those in Kingsport-Bristol were down 13.4%. The median home sales price in the Johnson City metro area was down 6.3% and up 2% in Kingsport-Bristol. 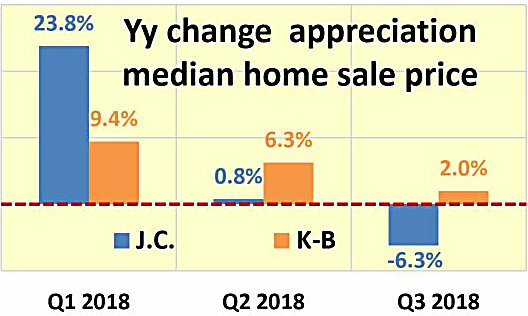 The Q3 median sales price since the bottom of the recession was up 41% in the Johnson City MSA and 60% better in the Kingsport-Bristol MSA. 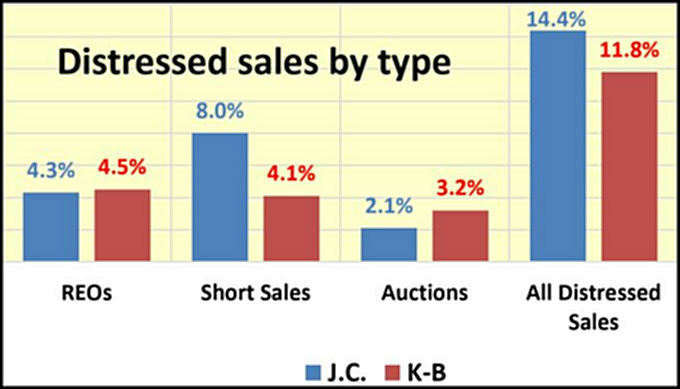 There were 470 all-cash sales in the Johnson City MSA and 429 in Kingsport-Bristol. The area where the numbers parallel for both of the Tri-Cities’ metro area was the share of institutional investor sales. It was done in both regions compared to last year but that doesn’t mean it cratered. There were 83 institutional sales in the Johnson City metro area in Q3 and 21 in Kingsport-Bristol. Attom’s report says the U.S. median home price increased 4.8% in Q3, which is the slowest rate of appreciation since Q2 2016. Locally, both the Kingsport-Bristol and Johnson City rate of appreciation was the slowest since Q1 2013. This year began with solid year-over-year appreciation for both metro areas – 23.8% in Johnson City and 9.4% in Kingsport Bristol. It declined from the beginning of the year in Q2 and Q3. The Northeast Tennessee marker is one of those with “more affordability cushion,” but most indicators from several sources point to local market slowing – just not as fast as what national numbers show. The Northeast Tennessee Association of Realtors (NETAR) Trends Report shows sales are still at record levels. The growth rate is seeing a normal seasonal slowing but closings are ahead of previous year’s pace. The big difference between the NETAR and Attom reports is the data coverage. NETAR’s reports are based on sales from the local multiple listing service (MLS) while Attom’s report is based on recorded sales of deeds, foreclosure filing, and loan data. Local MLS sales in Q3 accounted for about 70% of the Attom total from recorded sales deeds. Median home prices are above pre-recession levels in 69 percent of markets nationwide. NETAR’s September report shows the year-to-date local average sales price was 3.4% better than the first nine months of last year. The 2017 local annual price was 8.5% higher than the pre-recession annual average. Sales of bank-owned properties, short sales and sales to third-party investors at foreclosure auction accounted for 11.6% sales of U.S. single-family and condo sales in Q3. Locally they accounted for 14.4% of sales in the Johnson City MSA and 11.8% sales in Kingsport-Bristol. All-cash sales accounted for 27% of residential sales in Q3, down from 27.4% in the previous year. Sales to institutional investors (those who buy at least 10 properties in a calendar year) accounted for 2.8% of single-family and condo sales in Q3. That was a 2.1% increase from the previous year. Washington Co. VA – 1%. Data for the ATTOM Data Solutions U.S. Home Sales Report is derived from recorded sales deeds, foreclosure filings, and loan data. Statistics for previous quarters are revised when each new report is issued as more deed data becomes available for those previous months. Median sales prices are calculated based on the sales price on the publicly recorded sales deed when available. If no sales price is recorded then the purchase loan amount is used to calculate median price, and if no purchase loan amount is available, the property’s Automated Valuation Model (AVM) at time of sale is used to calculate the median price.